BaitRageous: Map of Beautiful Lake Conroe in East Texas! 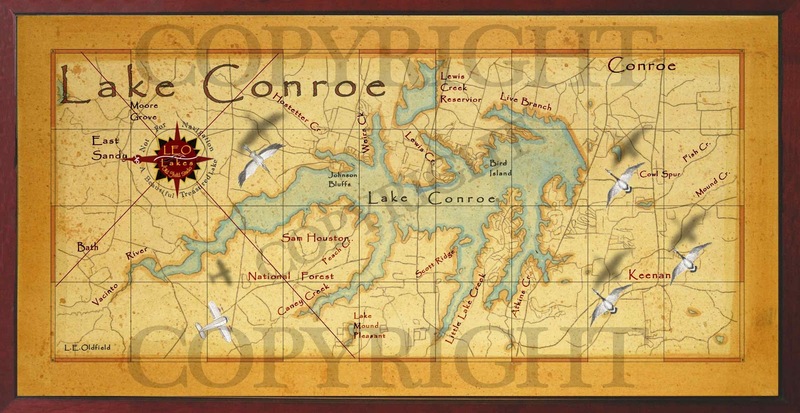 Map of Beautiful Lake Conroe in East Texas! I just finished a painting of beautiful Lake Conroe which lies on the West Fork of the San Jacinto River in East Texas. The 21,000 acre reservoir was built in 1973 as an alternate water supply for Houston. A notable island on the lake is Bird Island, which is a great place for waterfowl photography. Also, this lake has good size Largemouth Bass. The lake record is almost 16 lbs. "Life is short, get away from the big screen and get on a big stream."